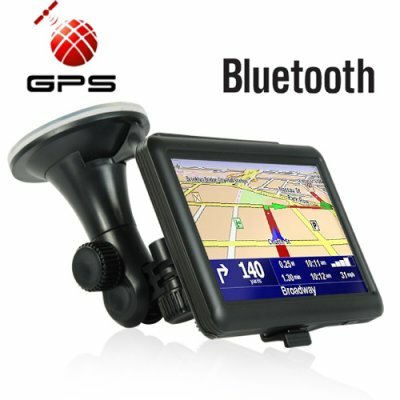 Successfully Added 5 Inch Portable Touch Screen GPS Navigator - Bluetooth (Black) to your Shopping Cart. 5 inch portable touch screen GPS navigator with Bluetooth fits nicely in your car and gives it that special classic look. Coming in a sleek form factor and raven all black body finish, this GPS navigator comes with Bluetooth and multimedia features, such as MP3/MP4 players and image viewer that are all accessible through the magic of touch screen technology. Thanks to its speedy performance and responsive touch screen interface, using this GPS navigator will give you the comfort that you have been searching for on your journeys. The best part, this model is compatible with most popular GPS software’s such as TomTom. Most GPS units that are available in stores near you are limited to GPS software’s. What makes our GPS units special? The multimedia enhancement features, and most of all, compatibility with a variety of GPS software’s and maps. GPS navigator units presents us with amazing benefits, which are all so neatly designed in a sleek and compact form factory device. Whatever may the reason you're purchasing a GPS unit for, there is no doubt what amazing benefits can a GPS unit provide you. A portable handheld unit can be used for various activities such as hiking, biking, or another outdoor activity which also includes driving. A handheld unit can save you time and money, no more wrong turns, no more getting lost, save money on gas, and wear and tear of your car. GPS softwares can also store maps, so if your going to an un-chartered area that has no GPS signal. You can download and store the maps in advance before heading out. This can be very useful in emergencies, and encase you get lost. This allows you to refer to the maps on your GPS unit for directions, just like using a normal paper map. This 5 inch touch screen GPS device comes in a pocket sized shape and can be carried around were ever you go and it fits nicely in your carry on bag. Before you head out, load it up with all your favorite music, video, and picture files. Listen to your audio files with the earphones or built-in speaker. This handheld GPS navigator comes with an easy fix-on bracket for your car, installing this unit only takes a matter of seconds. Straight from power up you instantly be amazed how easy it is to operate. The CVIO-CS20 has been engineered with usability and navigational testing for maximum user experience. This GPS unit supports functions like voice directions, automatic re-routing if you take a wrong turn, 3D mapping, and night mode. Use this GPS device to reach your destination on time every time. This is a executive high performance GPS navigator that comes in an attractive design with a professional look and feel to it. This portable GPS navigator makes a great product for singe/company use, resale market, online or physical store. You can get a few of these, keep on for yourself, and self of the rest, make a profit and be happy. The CVIO-CS20 is available to you straight from the leader in factory direct wholesale electronics, Chinavasion. This model is compatible with most brands of GPS software - however hardware specific software such as Garmin may not run on this unit. As the wholesaler, Chinavasion provides the GPS- enabled hardware only, not the software. Chinavasion provides no warranty or customer support regarding GPS software. Chinavasion cannot provide downloads / links / advice regarding GPS software. Any software installation you undertake should be performed or supervised by a professional. Very nice device. The software that is included in the GPS works properly in Greece. It uses greek language and the voice is in greek language too. I recomment it strongly !!! An excellent GPS, shame we do not have a map of BRAZIL, has installed a more updated map was very easy to install without problem, the GPS is unlocked, and has a great quality. For the EMS system takes a long time to receive here in BRAZIL. Its features are great.The device and features are very cheap regarding of its money.